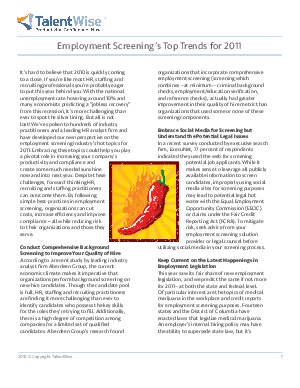 Gain insight into the future of employment background screening and how the industry will be changing. Learn best practices for mitigating risk, instituting cost savings and careful evaluation of social media usage to improve your hiring decisions. Screening new-hires incorrectly can bring on unnecessary risk for your organization. In TalentWise’s latest whitepaper, you will learn about cost saving tactics while conducting more comprehensive pre-employment background checks.